2 Comments on WordPress vs Tumblr: Which is the Perfect CMS Platform to Start a Blog? Blogging is very much the new trend these days. Many people are getting into blog writing to express their views, opinions or sharing their ideas with others through their blogs. Writing a blog is a very creative process and most difficult part of the process is to select the topic for your blog. Once the subject of the blog is decided, then you will have to choose a blogging platform which will be used to publish your blogs. There are many blogging platforms available which you can use for publishing your blog, however, there are two famous blogging platforms and they are WordPress and Tumblr. 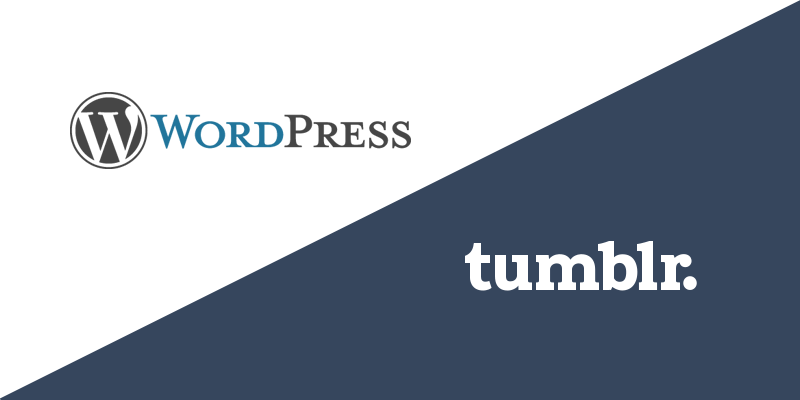 To decide the best platform for you, today we are going to make a comparative study of WordPress vs Tumblr. In this comparative study, we are going to compare various features of these two blogging platforms so that you will be able to choose the perfect platform for your blog. The comparison between these two blogging platforms will be done on the basis of various points such as compatibility, cost and strengths and weakness of each blogging platform. Tumblr is like a social network platform where people can create their own blogs and other bloggers can re-blog or like the blogs by other users. On the other hand, the WordPress is a full-fledged publishing platform where you can create a blog and you can turn it into a unique identity for you. Tumblr is a blogging platform which can be considered as a community-driven platform. It allows you to explore, re-post and share the blogs and posts created by other users. Whereas, the WordPress is a serious blogging platform where people create a blog to share their individual ideas, passions and views and opinions on various subjects. Tumblr can be a community place where like-minded people come together and share their ideas and concepts. The users are more into sharing their ideas with others rather than creating a special place of their own. WordPress, on the other hand, is for those bloggers who want to reach to a specific audience to share their opinions. Blogs on the WordPress are reflection of the personalities of the bloggers. Tumblr is a sleek platform, just like a social media platform where people come together to share common interests. There are not many widgets or plugins available in Tumblr.On the other hand, WordPress offers better freedom to grow as there are many widgets and plugins available so that you can create your own identity and specialty blog. Tumblr is free platform but purchasing some premium themes is possible by paying $9 to $49. WordPress is also a free platform, but if you want to turn your blog into a site then you can pay the fees of $99 and purchase a premium package with a lot of widgets and plugins which can be used to customize your blog. If we further want to talk about points of comparison in WordPress vs Tumblr, we have to say that Tumblr is a great platform where you can create a blog where you are listing many things of interest such as various photos, music or links. However, if you are interested in serious and in-depth blogging or customized site, then WordPress is the best blogging platform for you. Choose the platform according to the type of blog you are contemplating to write, so that it allows you to create a blog the way you want to write it. I like the WordPress more as compare to Tumblr because there are so many research has been done and lot of WordPress plugins are available also to make the blogging and online business more easier in terms of online marketing and improving conversion rate also. I am too friendly with WordPress as it can be customized as per our need and it is based on PHP, having advantage of unlimited plugins for anything we want to do with a blog. Nice Article thanks a lot.